White Box Walking Track map. From Top Walks in Victoria. 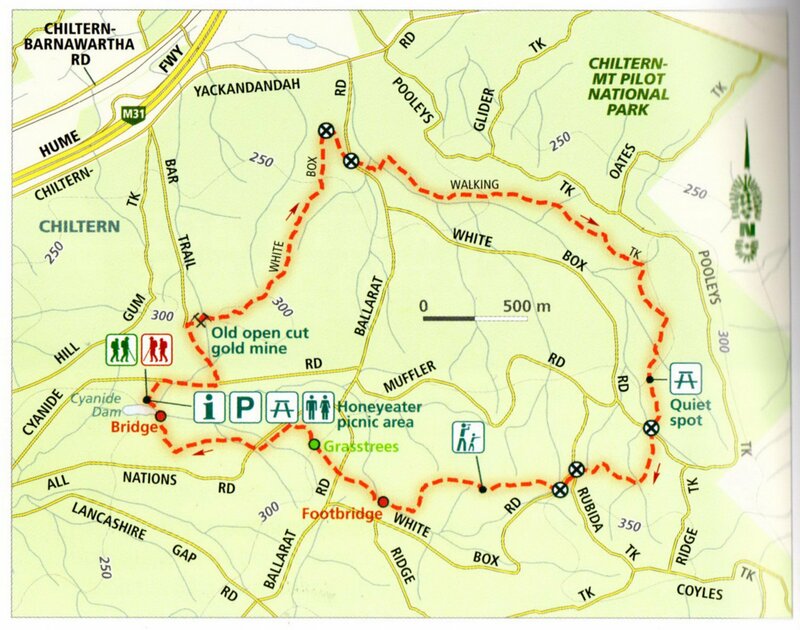 The way to Honeyeater picnic area is well sign posted and it would make a great place to have lunch after the walk. Having come straight from Melbourne and lunch at Chiltern this wasn’t needed for us. Track signage and directions are very good and a map is almost unnecessary. After you reach Cyanide Road from the picnic area you are supposed to go along the road, but there is an obvious track straight up the hill making it a bit shorter. The only gold digging relics around was the terrain cut away for the open cut gold mine near Gold Bar Mine. Being winter there were almost no flowers apart from some Wattle flowers that had fallen onto the track. The scenery is okay but it’s best walked during spring to see the wildflowers; and also allow more time for the walk. It’s not worth coming from Melbourne just for White Box Walking Track as there are better options closer to home. We didn’t encounter the tree that had fallen over the track mentioned in the text and shown in a photo. There had been a serious bush fire through the area and this would have changed things quite a bit. A nice finish to the walk (or after lunch) would be to walk around Cyanide Dam.